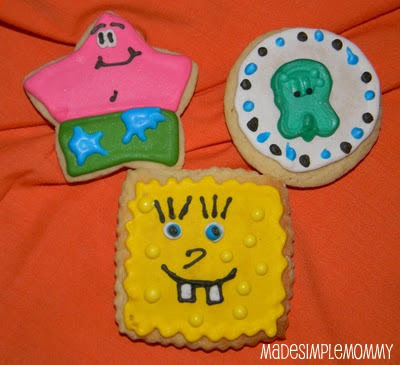 When I started advertising that I will bake cookies for people, I was asked to make Spongebob Squarepants cookies for a two-year-old's birthday party. Of course I asked if they wanted all Spongebob or a variety with the gang of characters, and they chose Spongebob, Patrick and Squidward. I realized I didn't have a rectangle cookie cutter! Patrick was no problem since he is a starfish, and Squidward...well he doesn't really have a good shape to fall into one specific shaped cookie cutter. So he was a free-hand on a circle cookie. 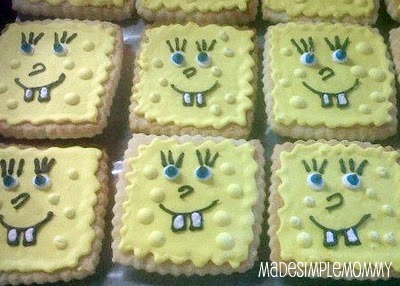 I searched Amazon.com and found a great set of biscuit cutters that would work great with Spongebob.